I love a great color block look, especially in the summer. such a cute look! I love all the colors. You look beautiful. This handbag is so hilaroius! Such a bright and fun look! That skirt is so gorgeous! Love this combo! I love all of the bright pops of color, a true summer win! Love the colors! So bright and stylish! Obsessed with that ice cream bag. Beautiful outfit :) Love this blog of yours too. You always wear so many beautiful colors together. So gorgeous. I love that handbag! So cute. Loving this look babe! That bag is too cute!! I love this color combo! The hot pink is so fun! You look so cute in this dress. nice colored combo. Youe handbag color is so suitable for your top and dress! Beautiful! I'm loving this color block look! 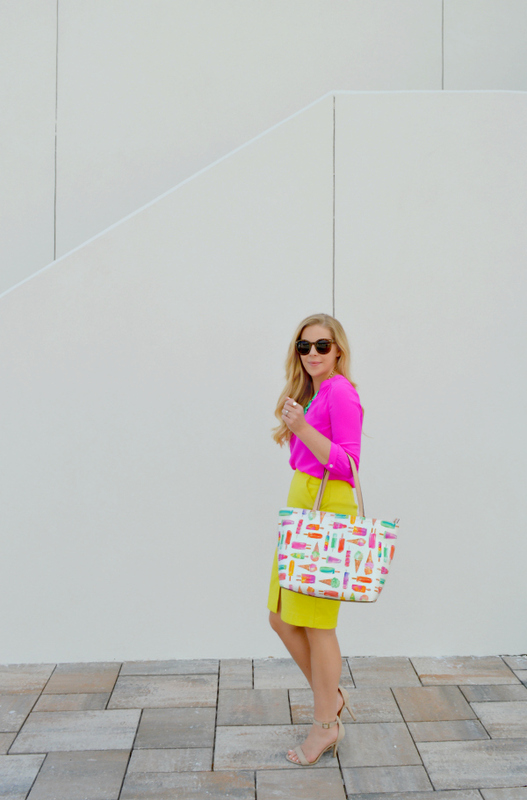 The pink and yellow look great together, and your bag is so cute! I love neon!! This outfit is so fab. Lovely color combo. You look great! This outfit is perfection! You styled this fabulously -- love all the colors! Gorgeous color combination, i love it! I love your outfit from head to toe! I am a big fan of combining bold colors! Loving this bright color combo! The color combo is killer! I could never pull this off - looks awesome on you. What a beautiful outfit. We really like your pictures and style! Those colors are so bright and bold and go so well together! 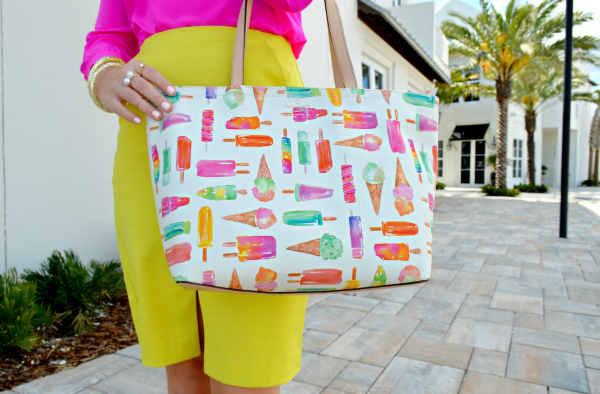 But my favorite part of the outfit has to be that adorable tote! Too perfect for summer! I love your outfit from head to toe! I am a fan of combining bold colors! Looking awesome to see these shoots . Like these .